Geotagging—adding data to a photo that reveals the location it was taken—has quite literally added a new dimension to enjoying and sharing photography. Online photo-sharing sites have added mapping capabilities, and iPhoto ’09 and other apps have made it simple to show when and where a prized photo was taken. But for many, technology has lagged—few cameras today offer the requisite GPS support, and add-on units are expensive. But if you have an iPhone, you can start tagging photos with the help of an inexpensive application. We’ll help you pick the right one. The basic workflow for each of these applications is similar. While shooting with your camera, you run an application on your iPhone that periodically captures your location from the built-in GPS sensor. After you’ve wrapped up your shoot, you’ll merge the location data from the phone with the pictures from your camera. That merge process is usually based on time—the GPS data delivers the precise time the fix was captured, which is mapped against the time photos were taken. There’s a Map for That: Placetagger is simple to use, and offers a helpful map showing your current position. Placetagger from Return7 is remarkably simple to use. Simply open the application, tap the screen, and wait for the device to capture a GPS signal. Once your position is determined, it appears on a map, and you can start shooting photos. Modifying settings is easy, with a simple slider allowing you to select the desired trade-off between accuracy and longer battery life. More precise settings can be made with an advanced mode, which reveals specific distance and time settings the app uses to guide the capture of position fixes. Placetagger even includes a large clock that simplifies setting the time on your camera so it matches your iPhone to the second, improving the accuracy of tags. Merging location information with photos is almost as easy. Like most applications, you’ll start by downloading your photos to your computer. (On Macs, just use Image Capture, which you’ll find in your Application folder.) A free Placetagger desktop application, which creates a backup copy of your photos before merging, is available from Return7. Once processed, you can import the photos into a photo application, like iPhoto, or upload them to a photo-sharing Website. Aperture users can avoid much of this with a plug-in that’s installed when you add the Placetagger desktop app to your system. Like all the other applications Placetagger can creates a GPX file that can be used with a wide range of other applications. Plan Your Trip: Waypoints can be planned in advance with PhotoTrip. 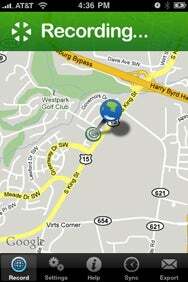 The app lets you see the location on a map and capture a photo for reference. Ambertation’s PhotoTrip offers an elegant and intuitive interface while delivering some unique capabilities. For example, PhotoTrip allows you to plan visits to specific waypoints on your route. Once you arrive, take your photos and flip a switch from “Planned” to “Visited” to record a precise location. Each position can be viewed on a map, and you can even capture a photo of the location with your iPhone for later reference. Like the other apps, you can also instruct PhotoTrip to automatically capture your position on a set schedule, in this case ranging from every 10 seconds to 30 minutes. Ambertation offers a Geotagger desktop application which supports tagging of photos in a folder, or via an Aperture plug-in. Location data can be retrieved from an exported file, or directly from the iPhone over a wireless network. PhotoTrip also generates GPX files of position information. Help and instructions are easily discovered on the Website. PhotoTrip is easy to use, although a bug in the desktop application caused problems with tagging. Support was prompt, and once corrected, the application performed with a high level of accuracy. Names and Places: With GeoTag, you have the option of capturing location data based on the name of the photo. GeoTag from Salt’n’Pepper provides a name-based approach to tagging photos, in addition to the time-based methods used by other applications. In practice, tagging by name is most practical when shooting a few images at a time, or when long gaps will occur between shots. You set up the app by specifying the standard prefix your camera uses to name photos—usually DSC, IMG, or the like. You also indicate what sequential number is next in line. Each time you take a picture, you collect position information by tapping a button which also advances the count. The approach has the potential of offering high accuracy, since locations are matched to a specific photo. But when shooting several pictures at a time, it was easy to forget to manually capture the data, leading to inaccuracies. Automatic collection works well, but doesn’t provide controls for adjusting the frequency of data capture. The workflow for matching up photos and locations is similar to other apps. Photos are downloaded to your computer, and a desktop application extracts location data from GeoTag on the iPhone. The desktop application requires you to manually enter an IP address provided by GeoTag on the phone. Loading photos into the desktop application proved to be resource-intensive, maxing out a dual processor for several seconds while completing the process. Despite those issues, GeoTag can be a good choice, especially for photographers who shoot at a measured pace or who can take advantage of the large number of image formats supported by the application. Location, Please: Simplicity is the watchword with GeoLogTag, which provides a straightforward easy-to-understand interface. GeoLogTag from Galarina takes a minimalistic approach to the geotagging task, providing a simple two-part interface. Part one focuses on logging data—simply press a button, and the app will capture a fix and begin recording. Modifying the frequency of data capture is accomplished directly on the screen by selecting how far you need to move before another record is captured. The benefit of this approach is that no desktop application is required. Just turn on GeoLogTag on your iPhone, point to the shared folder, and press the button—tagging is fast and accurate. GeoLogTag also offers an option for tagging your photos on Flickr. Setup is required here as well to identify your Flickr account and authentication credentials. Once set, though, you simply upload your photos to Flickr, turn on the app, and press the appropriate button. When you next visit your photostream, you’ll be able to view photos on a map. A free version of GeoLogTag recently became available from the App Store. It stores location data for only two hours—long enough to try the app out and go through the tagging process to see if you want to buy the full version. There are a variety of factors to consider when selecting a geotagging application. For most individuals, workflow-the process you use to move photos from camera to computer, and how you plan to share photos-will be an important criteria. Most people already use a desktop application for the process, so the multiple steps needed to download, tag, and import photos into your editing application may prove cumbersome. Placetagger and PhotoTrip both eliminate that work with plug-ins for Aperture, while PhotoTrip also interfaces with iPhoto. If you go straight to sharing, GeoLogTag is the only tested application supporting tagging of photos in Flickr. Another important consideration is your style of photography. If you take pictures frequently while on the move, sophisticated controls over the frequency of GPS fixes-like those delivered by Placetagger-will help balance accuracy with battery life. More casual photographers may prefer the option to only capture location data on demand, as supported by PhotoTrip and GeoTag. In addition, you should consider support for different image formats, especially if you shoot in RAW format. (All of the applications reviewed here support JPG, while some support many more). In terms of compatibility, all four of the apps mentioned above work with any iPhone. Placetagger and GeoLogTag promise compatibility with the iPod touch as well, while GeoTag supports second-generation models of the touch; PhotoTrip only offers iPhone support.